< 5 min.< 10 min.< 15 min.< 20 min.< 25 min. 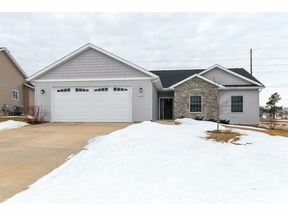 **OPEN HOUSE MARCH 2nd 12:30-1:30 PM** Nearly new Northwest Davenport zero step entry ranch home. Quality built with 4 bedrooms and 3 bathrooms. Featuring Schrock cabinetry with soft close doors and quartz counters, you will not be disappointed! The basement features a rec room and two egress windows a 4th bedroom and 3rd full bathroom! Walk in from your over sized 2 1/2 car garage into your laundry room with built in "lockers". Unwind at the end of a long day in front of the fireplace in the great room and when the weather breaks head out the sliders to your deck and be ready for grilling season and bonfires! All information deemed reliable but not guaranteed and should be independently verified. All properties are subject to prior sale, change or withdrawal. Neither listing broker(s) nor Keller Williams Realty Greater Quad Cities shall be responsible for any typographical errors, misinformation, misprints and shall be held totally harmless. ©2019 Quad City Area REALTORS® Association. All rights reserved.